LINCOLN — The Nebraska High School Sports Hall of Fame Foundation will induct 11 athletes, five coaches, one contributor and one official at its annual Induction Ceremony Oct. 1 at Lincoln East High School. And two coaches who coached in the KVSH area leading their teams to numerous state championships will be inducted. 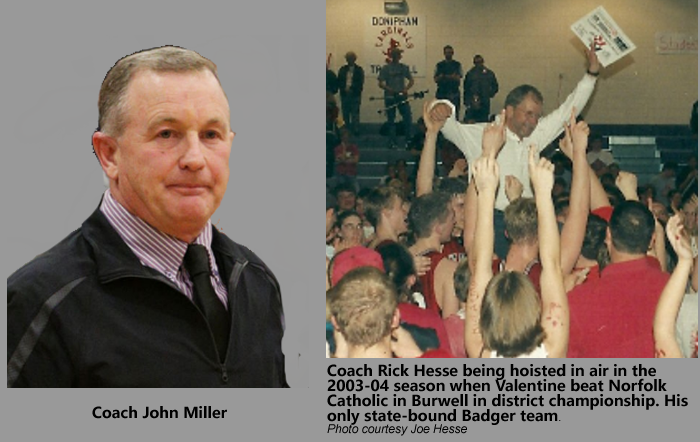 The late Rick Hesse, who coached basketball at Clearwater and Valentine will be inducted. Coach Hesse led Clearwater to four consecutive state basketball titles from 1984-87. He finished with 440 career wins and 12 state tournament appearances. John Miller who coached at Chambers and at Southern Valley, retired as the winningest basketball coach in Nebraska history with 709 total victories — 585 wins and five state titles coaching the Chambers girls and 124 wins and one state title with the Southern Valley boys. The athlete group includes three former Husker football players and one Olympian. The five coaches have coached teams to 18 state championships.